Luxury Curved Chrome Towel Radiators. These iBathUK luxury curved chrome towel rails offer you a higher quality radiator at unbeatable prices. These luxury towel rails feature thicker, higher performance rails giving you a higher heat output than most ordinary towel rails on the market. High quality triple layered chrome finish. High grade low carbon steel construction. Can be easily converted to dual fuel. Safety tested at 10 bar of pressure. Give our experienced customer teams a call on 02476 389 051. Luxury Curved Chrome Towel Rails. 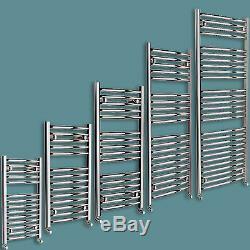 These iBathUK Curved Chrome Towel Rails offer you quality radiators at unbeatable prices. These luxury towel rails feature thicker, higher performance rails and giving you a higher heat output than most ordinary towel rails on the market. We offer an industry leading 10 Year Guarantee on all our products, so you can rest assured that your towel rail will last the test of time. Highest quality triple layered chrome finish 2. All brackets and fixings included 3. Low carbon steel construction 4. Valves are excluded, you can find them here. 1 What is a BTU? BTU (British Thermal Unit) is the heat output of a towel rail. Our towel rails are manufactured to provide maximum heat output, therefore our BTUs are higher than many other sellers. You can check the BTU requirements for your room using a BTU calculator, this will ensure you choose the correct iBathUK towel rail. 2 Which radiators have the highest BTU? Usually, the larger the towel rail the higher the BTU. However, you could also select a towel rail that has more rails. These extra rails can significantly increase the amount of heat given whilst maintaining the stylish look. We offer extra rail versions of most sizes. 3 Can this radiator be used on a standard central heating system? IBathUK radiators can be used on all standard central heating systems. Or you can opt to convert your radiator to dual fuel, which will allow you to use the radiator when your central heating is off. 4 What is a Dual Fuel towel rail? IBathUK Dual Fuel towel rails give you the choice of two different energy sources for one towel rail: electric or central heating. This will save you hundreds of pounds each year, as you won't need to turn on your whole central heating system to warm up your bathroom! This is why we offer a basic and luxury range, to cater for all budgets. Our basic radiators have fewer rails than our luxury radiators, but the same industry leading 10 Year Guarantee! To receive your orders before Christmas, please see our last order dates below: Small - Medium Orders i.
E Baths, Shower Enclosures, Toilets. Any orders placed after these dates will be delivered from. Please note: Express deliveries will not be available from Wed 21st Dec - Wed 4th Jan. Zone - 1 Mainland England, Wales and Scotland Lowland. Zone - 2 Scotland Highlands, Offshore Islands, Northern Ireland. Small Items Dimension is below 1.8m (1800cm) and below 25kg This includes items such as Taps, Showers, Towel Rails, Radiators and Bathroom Accessories. Large Items Dimension is above 1.8m (1800cm) and above 25kg This includes items such as Shower Enclosure, Baths, Furniture, Bathroom Suites. Small Items Dimension is below 1.8m (1800cm) This includes items such as Taps, Showers, Towel Rails, Radiators and Bathroom Accessories. We have teamed up with the reliable couriers Parcel Force. All items are delivered between the hours of 8am - 6pm Monday - Friday. All items must be signed for. This allows you to track your order from our warehouse to your front door. If you are not at home the courier will leave a card through your door. This will give you instructions on how to retrieve your order at your convenience. Please check your address and day time contact details are correct. Your order will be dispatched by Parcel Force. The courier delivers your order. Townsend Drive, Attleborough Fields Industrial Estate, Nuneaton, CV11 6RU. I do not wish to keep my item - it is not faulty. My item has develped a fault. For guarantee reasons we need photos of the offending item and its fault. Once this information has been received we can assess the case and whether a part or replacement is needed. You must also have taken reasonable care to not mark or damage the product. If trying on items with health or hygiene sensitivities, such as underwear or swimming costumes, please do so over other clothes. In the case of goods such as earrings, body jewellery & personal grooming products that have hygiene seals, you must exercise reasonable care by not removing the seals when examining them. What does this mean for you? In the very unlikely event that one of our products is faulty, you can return it to us for a replacement, up to 10 years after you bought it. If your item does become faulty.. There are a number of reasons why your item might not be working as well as it did when you first bought it. It's very possible we may be able to solve your issue without you have having to return your item. We will need images of the product and fault sending over to us so we can analyze the issue and try to solve the problem. If they are unable to solve the problem they will ask you to return the item for an inspection. Want The Best Bathroom Deals? Get the updates from our constant increasing range, our extensive deals and the amazing prices first hand. You don't want to miss out! The item "Luxury Curved Chrome Designer Towel Rail Central Heating Bathroom Radiator" is in sale since Tuesday, July 23, 2013. This item is in the category "Home, Furniture & DIY\Bath\Towel Rails".